Join Houghton Mifflin Harcourt Senior Designer and Art Director Andrea Miller and the Picture Book Whisperer Herself, Dr. Mira Reisberg (AKA the Fairy Godmother, and Clear Fork Publishing/Spork Art Director and Editor) for our highly interactive Illustration Course complete with fab fresh Submission Opportunities! IT'S ALL STARTING AUGUST 20th THROUGH SEPTEMBER 22ND FOR FIVE FABULOUS WEEKS PLUS A BONUS INSTANT ACCESS WEEK. And when we say 5 weeks, that's not a lesson a week - but five jam-packed time-flexible weeks! Are you a writer wanting to illustrate your own books or would you like to become a better writer by fully understanding how to leave space for the illustrator and how the process works? Or maybe you are a beginning or professional illustrator wanting to update your skills to move into new markets? Whether you’re at the stick figure stage or have won awards – you will wildly increase your chances of publication with this course!!! ​If so join us in this totally updated INTERNATIONAL course!!! DIGITAL OPENS DOORS TO ​MAKE THINGS POSSIBLE THAT WEREN'T BEFORE!! While we have lots of demonstrations, techniques, and useful information on working with a wide range of traditional drawing, painting, and mixed-media materials and techniques, we're in the 21st century and all illustrators can radically benefit from digital skills! Actually it can be massive fun, so we've revamped this course to include a wonderful array of demonstrations and lessons to help you learn to play and have fun with these. You'll be learning lots of Photoshop techniques including how to work with layers and upload and organize custom Photoshop brushes as well as textures that can make your work indistinguishable from traditional materials in a fraction of the time. How to play on your iPad to create stunning images in Pro-Create, and how to draw, create shapes and patterns, and do value drawings to prepare for color in Adobe Illustrator!! This part alone is worth way more than the price of registration! ​The What: It's a 5+ week online interactive e-course/training program that teaches you just about everything that you need to know about illustrating children's books and getting illustration work; building an illustrator or author/illustrator platform, and selling your work, with an additional 6 months of access. For writers, we teach you exactly how the illustration process works to enhance your writing process and maybe, you might, as others have done, discover your own inner artist, with the fun easy techniques. We use scaffolded teaching techniques for fearful beginners, courageous writers, award winning illustrators and everything in-between, as you either create a picture book dummy and color sample or portfolio pieces! The When: Monday-Friday: The course starts August 20th with the first live training happening that night and runs through September 22th. It's designed to be extremely time flexible so you can access the materials and interact as much or as little as you like. No one is ever in trouble, but the more you can put in the more you'll get out of it. The additional 6 months of access or more makes it very doable no matter how busy you are and the private Facebook group continues on indefinitely to provide continued support for your children's book goals. The Where: The comfort of your own home, a café, the library, in bed, anywhere that you can get Internet access. You don't need to travel anywhere for this course plus you can still take it even if you are traveling. ​The How: Fresh lessons, demonstrations, exercises, and interviews and studio visits from our awesome contributors are released on our password protected website that also includes tons of resources including lists of publishers and agents, worksheets, done-for you templates, and much more. We interact via our private Facebook group where questions are answered and small critique groups are set up for those who want them. We have a special webinar page for each week where students post responses to each webinars topic - e.g., thumbnails, quirky or memorable characters etc. Times are scheduled to accommodate folks in different countries as much as possible and we also record the webinars for those who can't make it live. The Why: The most important one. If you want to illustrate children's books or learn how illustration works, this is the best value course to successfully get published. It's the original 5wk interactive picture book illustrating course with industry experts and a multi-award-winning best-selling faculty, with a phenomenal proven track-record of published, contracted, and now agented former students. No other course gives this level of focused attention to each student, with a money back guarantee for folks who do the work and still don't think that they learned a tremendous amount after a year. The course is also the only one that provides fantastic submission opportunities and empowers students to do all sorts of extraordinary things. The Who: This industry leading children's book illustration course is co-taught by two acquiring art directors with many years of experience in the industry along with weekly editor, agent and art director reviews and top expert illustrator interviews. Currently only 647.00 (With lovely optional Payment Plans). There are currently only FIVE of these left! Dr. Mira Reisberg is a multi-published award-winning children's book illustrator and author whose books have sold over 600,000 copies. Besides running the Children's Book Academy, she is also an acquiring Editor and Art Director at Clear Fork Publishing's children's book imprint Spork. Mira is also a former children's literary agent, and a university professor who taught kid lit writing and illustrating courses as well as teacher ed. She has a PhD in Education and Cultural Studies with a focus on children's literature and has helped MANY writers and illustrators get published. Her job at Spork allows her to help even more people. Andrea Miller has designed and/or art-directed many successful children's books for both Sterling Publishing and Houghton Mifflin Harcourt including, "Lady Pancake and Sir French Toast" by Josh Funk, "Mira Forecasts the Future" by Kell Andrews, "Accident!" by Andrea Tsurumi and "Winter Dance" by Marion Diane Baur. Most recently, she co-art directed and designed the #1 national best-selling children's book, John Oliver's "A Day int he Life of Marlon Bundo". Andrea is also a published illustrator, and is co-creating a series of comics with her wife. She is excited and honored to jump in with the Children's Book Academy for a rewarding experience as part of their esteemed faculty while looking for fresh talent in this course. A Golden Ticket is when you get to submit directly to an agent, art director, or editor and bypass the slush pile or closed house submission policy. In this course we will be teaching you how to create dummies and color samples, postcards, and websites that will catch an agent's, editor's or art director's eye. Then our panel of judges will look at a secret website page of student samples to choose illustrators or dummies that they're interested in seeing more from. 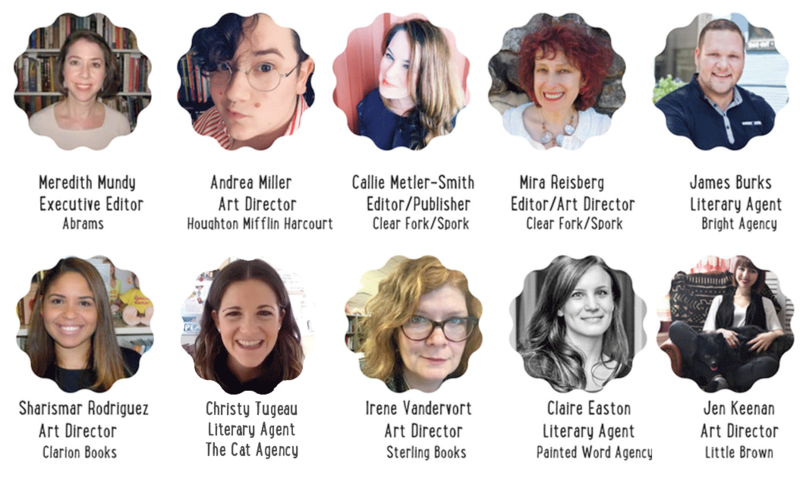 Here's our awesome lineup featuring editors, art directors and agents who can open many doors for you! Even if you attended a major conference, you would not have this many submission opportunities! These Golden Ticket judges will ALSO be Providing LIVE MENTORING Opportunities with Priceless CRITIQUES! There Will be Five of Them, So, Stay Tuned! Claire began her publishing career at Painted Words in 2012 as an assistant, and worked her way up to Agent. She represents picture books, chapter books, and middle grade novels, with picture books being her sweet spot. For picture books, she looks for stories with humor and heart, relatable characters, unpredictable endings, and books that reflect the diversity of children’s experiences. Her favorite stories inspire compassion, curiosity, and a fresh way of looking at the world. She is also seeking commercial non-fiction about unusual or lesser known subjects in history and science. For middle grade, she especially likes contemporary realistic books written in a unique voice. Claire lives in New York City and is the member of a writing group and too many book clubs. Sharismar designs and art directs children's books for all ages, from Picture Books to Middle Grade and YA novels and Non-Fiction volumes. Some of her work includes award-winning and noteworthy titles such as New York Times bestseller Greenglass House by Kate Milford, illustrated by Jaime Zollars; Society of Illustrators Los Angeles Illustration 50 West winner 10 Rules You Absolutely Must Not Break If You Want to Survive the School Bus by John Grandits, illustrated by Micheal Allen Austin; Maybe Something Beautiful, an ALA Notable Children's Book recipient, by F. Isabel Campoy and Theresa Howell, illustrated by Rafael Lopez; among other books. Jen is both an Associate Art Director and a Freelance Illustrator who loves all aspects of the art making process. She has helped bring beautiful and quirky books like Radiant Child - written and illustrated by Javaka Steptoe, A Big Mooncake for Little Star - written and illustrated by Grace Lin, Doll-E 1.0 - written and illustrated by Shanda McCloskey, and Otis and Will Discover the Deep: The Record-Setting Dive of the Bathysphere - written by Barb Rosenstock and illustrated by Katherine Roy into the world and children's happy hands. James specializes as an agent in commercial illustration based in the US Bright office. With proven success in his management skills with external and internal stakeholders, James provides fuss-free creative solutions across all genres of children’s literature. He has built a reputation in publishing by understanding the needs of his commercial and fictional audience - not to mention his warm and approachable personality. PLUS WE HAVE AN ADDITIONAL $65.00 EARLY BIRD SPECIAL ENDING August 7th! 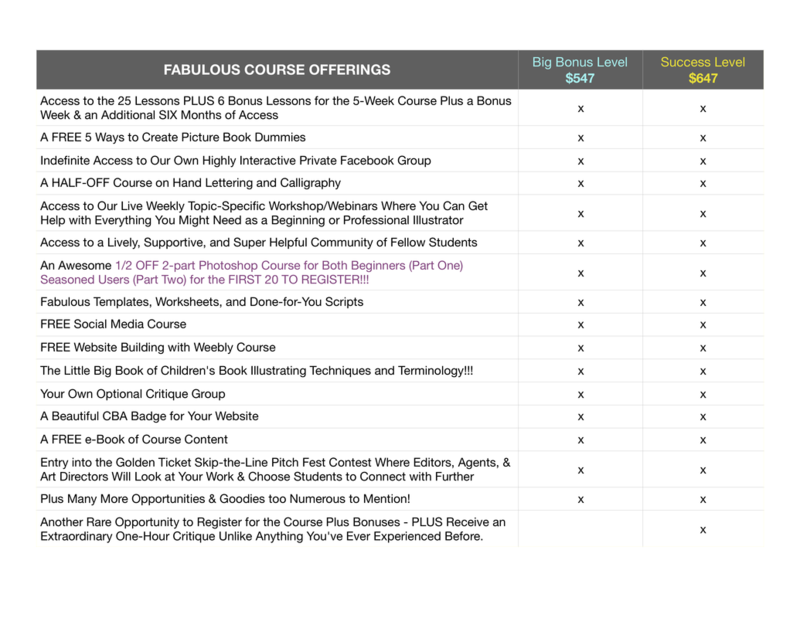 And the Success Level (The Course, PLUS BONUSES Plus a ONE HOUR IN-PERSON CRITIQUE with Andrea is ONLY 582! 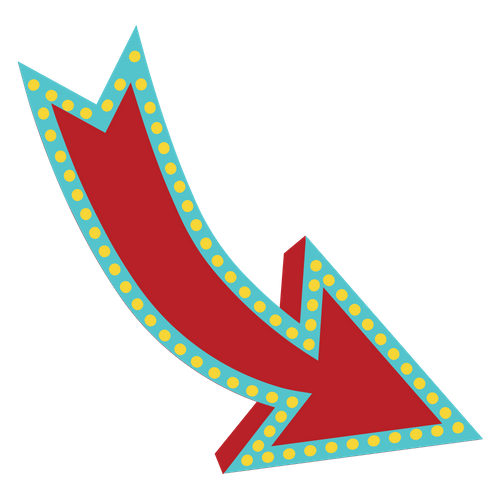 All of Mira's deeply deeply discounted critiques are gone but even at the course's full price cost, it's still deeply discounted from a stand-alone critique. Unfortunately there are only FIVE of these left. The Big Bonus Level described above also comes with sweet payment plans if needed!! Another rare opportunity to register for the course plus bonuses plus receive an extraordinary one-hour critique unlike anything you've ever experienced before. This option also comes with awesome payment plans to include the course, bonuses and a session with the Picture Book Whisperer and Fairy Godmother herself who loves making dreams come true!! ***No other course can offer more from a more talented group of creatives. Registering for The Craft and Business of Illustrating Children's Books is a genuinely useful investment in your career with a priceless return on this investment and it comes with a money back guarantee that if you fully participate and do the work, if at the end of a year you don't feel that you learned a lot, we'll give you your money back! These 'Success Story Mentors', who are former now published illustration students, will be sharing their publishing and illustrating journeys LIVE every Friday in the Facebook group while answering questions helping students with their own work and publishing journeys. These include Jorge Lacera, Sandra Bartholomew, Chantelle and Burgen Thorne, Sandie Sonkie, Sarah Momoharo Romero, and John Seckman. Watch for Chantelle and Burgen Thorne who wanted to move from educational to trade illustration markets and now they have!! They will be showing you exactly how they created these two digital images for former Craft and Business of Writing Children's Picture Books student Sandra Foreman Sutter who also took the illustration course. Yep, we hire writers in this course as well. Mira fell in love with this soon to be available story,The Real Farmer in the Dell, when Sandra took the illustration course to access her inner artist and learn how the other part of picture books works. Then she paired her with Chantelle and Burgen who also contracted The Singing Stone written by Wendy Hartmann after taking the course. It's been a match made in heaven. Hard to believe that they are both digital images! Besides teaching you tons of stuff, they'll be joining us live in our Facebook group to answer questions and inspire you. Sandie Sonke will be sharing her TOTALLY COOL iPad Pro-create techniques for these images in Scarlet's Magic Paintbrush written by course assistant and future Picture Book Writing co-teacher Melissa Stoller. As you can imagine, I'm all a twitter! Like a proud parent as Sandie gets signed for more and more books. Her work is beyond adorable and you'll love meeting her in the class. And then there's Sara Momo Romero, our soon to be published former student responsible for the deeply adorable Wake Up Little Bat who will be sharing digital tips and tricks that she picked up along her journey. Check out her portfolio at SarahMomoRomero.com. We also have San Francisco City College Digital Art Professor and former student John Seckman joining us. John will also be showing and telling you about how to use Adobe Illustrator, which is great for those of you who love flat art with pattern. It's pretty cool. John is currently illustrating former writing and illustrating Eleanor Ann Peterson's Juraissic Rat, which is both really funny and very soulful. Can't wait for you all to see it! Finally, there's traditional and cartoon artist, the super-talented Sandra Bartholomew, who will be sharing some of the fabulous watercolor and pencil illustration techniques that she used in Melissa Stoller's Ready, Set, Go! and also sharing and demonstrating graphic novel and cartoon style illustration. Another awesome book. There Wonderful Now Published Former Students Are Joining the Weekly Mentorship Lives Section of the Course - Eager to Share Their Techniques, Career Knowledge and Wisdom to Help You!!! FREE Fun with Photoshop Course Parts 1 & 2 for the FIRST 20 STUDENTS TO REGISTER! 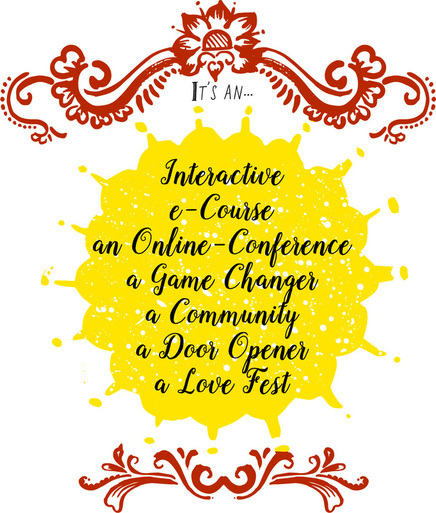 FREE Fun with Social Media Course! FREE 5 Ways of Making Dummies Mini-Course !!! PLUS! An EXCLUSIVE Insider Video Tour Led by Brilliant Chronicle Books Editor Melissa Manlove Who Shows and Tells What Really Goes on in a Major Children's Book Publishing House! and yet, it is a truly affordable one for all that you receive!!! The BIG BONUS comes with EVERYTHING ABOVE AND MUCH MORE Just click the graphic above for the Adventure of a Lifetime! How often do you get to take an incredibly comprehensive course with a ton of bonuses plus a one-hour critique with a fantastic major house Art Director? You don't want to miss out on this amazing opportunity! Just click on the image above. If You Are Up For a Wild Adventure With the Course, Bonuses and Extra Time with Mira just click the pic above. ***There Are Not a Lot of The Critique Options Available, So, Sign Up Soon if You Want One! ​Who are these gorgeous people that you'll be learning from? These are just some of our expert guest contributors who will speak to you in custom created videos and written interviews! They'll be sharing their perspectives on everything from art tips and secrets on how they have built their careers, conceptual versus narrative illustration, researching and illustrating non-fiction, what happens inside a publishing house, what they look for in submissions, creating an illustrator's platform to make you more attractive to publishers and so much more. Week One: Book Structures, Portfolio Samples and Dummies; Illustration Prompts and Easy Peasy Drawing with Shapes, Thumbnails; Interviews with Awesome Experts, and Live Critiquing and Q&A Webinar with Follow Up Recording! Week Two: The Hero image, Getting in Character, Transfer Techniques, Watercolors, Figure Drawing, Body Language, Facial Expressions; Setting up Your Studio, Composition, Easy Peasy light and Shade; Incongruence, Critiques, More Interviews, and Another Live Critiquing and Q&A Webinar with Follow Up Recording! Week Three: Urban and Nature Settings, World Building Perspective, Tricks for Consistency; Acrylics, Collage, Stamp Making, and Mixed Media; Color Theory, Agents, Reps, Editors, and Art Directors - which one is for me? Writing Your Cover or Query Letter, Critiques, Interviews with Awesome Experts, Live Critiquing and Q&A Webinar with Follow Up Recording! Week Four: Drawing and Loving Animals; Glorious Black/White Illustration for Chapter Books and Middle Grade, Anthropomorphism Pros and Cons; 2nd Visual Stories; Beyond Animals - Unusual Protagonists, Great Animal Characters, The Kiss of Love - The Importance of Showing Emotions and Relationships; Interviews with Awesome Experts, Live Critiquing and Q&A Webinar with Follow Up Recording! Week Five: The Art of Submission, Samples, Tear Sheets and Postcards; Publishing, Contracts, Digital Illustration, Easy Peasy Photoshop, Making Connections; The mechanics of printing - 4 Color Process Printing and Bleeds, What makes a bestseller? Social Media for Illustrators, Interviews with Awesome Experts, Live Q&A Webinar with Follow Up Recording! This course is designed for busy people and set up to be time-flexible with six months additional access and an e-book of everything at the end. You can go as fast or as slow as you like. The only time commitment to the course is to post your critiques of your 2 group critique members each week if you join an optional group. And don't worry, we'll have easy critique guidelines. We are so very, very grateful for our wonderful assistants who make sure that everything runs smoothly to optimize student's experiences. This Childen's Book Academy grad has​ two picture books available soon, Scarlet's Magic Paintbrush and Ready, Set, GOrilla! The illustrators for both of these books will also be joining us live in the course. Tina is a graduate and assistant for the Children's Book Academy, a member of SCBWI, and an Admin for the Debut Picture Book Study Group. In addition, Tina is a volunteer with The Literacy Coalition of Onondaga County, Book Buddies, and a 2016 recipient of New York State's Teacher of Excellence Award. She is currently teaching middle school - living in Syracuse, New York with her husband, daughter and two akitas. Remember that all of these levels are available with Payment Plan options and a money back guarantee. Just click on the image of whatever level you want below to register! Hooray!!! It's going to be awesome.